Your Bloomingdale Florida Ceiling Contractor specializes in popcorn ceiling removal. These ceilings (also called acoustic ceilings) are a surface that will attract and harbor dust particles floating freely in your household air. Removing popcorn ceilings and applying a surface that does not attract dust particles will help contribute to the quality of your indoor air and increase the value of your Bloomingdale home. Florida homeowners spend lots of time and money refurbishing their home without touching their popcorn ceilings. The lower half of their home looks lovely but the old, dramatic, dirty acoustic ceilings date the home to the 70's. Removing the acoustic popcorn ceilings from your home will and bring your home up to date. Once your Florida home and furnishings are protected we begin to scrape the popcorn and subsequently skim for smooth/slick or spray knockdown. Minor drywall repairs are usually done at no extra charge, however if the repair is extensive we offer a full drywall repair service at very competitive prices (this cost is always in the original proposal so there are no surprises). Whether your Bloomingdale home is fully furnished or vacant (lesser cost), we take every precaution necessary to keep your home and furnishings safe and clean. With over 24 years of experience in Bloomingdale and the surrounding area, our most valued asset is a satisfied customer. Your Bloomingdale Ceiling Contractor understands that quality work leads to referrals and our customer satisfaction is our number one priority. 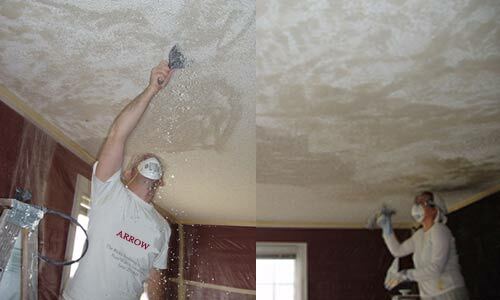 If you're looking for a Bloomingdale Ceiling Contractor Specializing in Popcorn Ceiling Removal, Popcorn Ceiling Repair, Drywall Repair, and Texture Ceilings and Walls, contact Arrow Ceiling Restoration today at (813) 840-3717, or complete our estimate request form.